Join us for a festive concert to warm our hearts during the coldest days of winter. 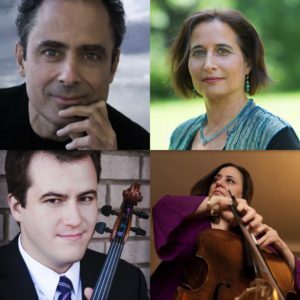 We are excited to welcome back cellist Roberta Cooper and violinist Eugene Drucker (Founder of the well known Emerson String Quartet and Music Director of The Berkshire Bach Ensemble). Violist William Frampton and Artistic Director and pianist Gili Melamed-Lev will join them in the Piano Quartet in G minor by Mozart, Piano Trio in one movement by Grieg, String Trio in G major by Beethoven and Soantensatz by Brahms. All are welcome to the reception with the artists following the concert. Only a few tickets are left! You can purchase tickets online or via telephone by contacting Ivy Sharron, concert coordinator, at (518) 392-2760 ext. 119. Save-the-date and purchase tickets in advance for piano recital with Simone Dinnerstein on March 9th, and the gifted Students and faculty from The Bard Conservatory of Music on April 6th.